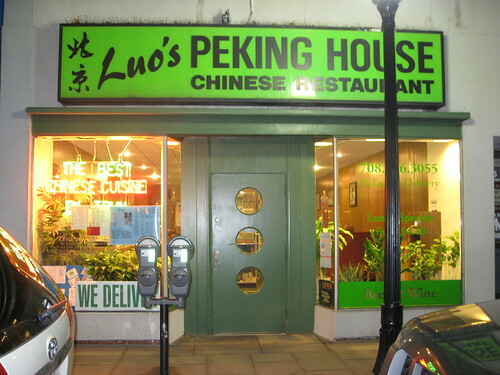 Luos has been discussed in several threads, A few in Oak Park - Luo's Peking House, Vivaldi and Chinese food in the Oak Park area, but has never had its own thread…maybe for good reason. You could drive by this place a thousand times, as I have, and barely give it a thought. 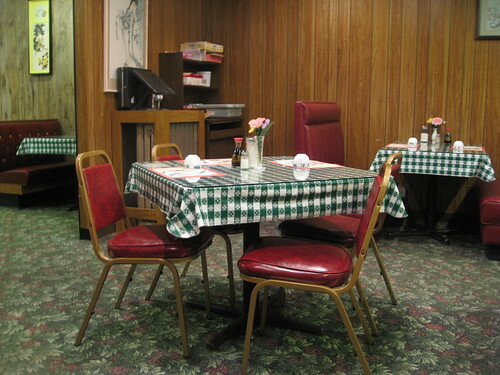 It looks like many other local Chinese diners, with the circular cut-outs on the front door, the simmering neon in the window, red and green color scheme and daily specials duly extolled. Tonight, The Wife had a bad tummy and was really in the mood for something not too challenging. 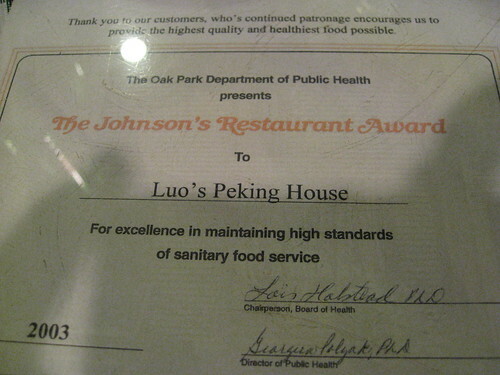 We had been talking about Luo’s a few days ago, and it was on her mind, so that’s what she wanted. The soundtrack was perfect: the theme to the Godfather done up with Chinese instrumentation. I figure if I’m going to go Schaumburg Chinese, I might as well pull no punches. I had the orange beef, which was really chewy, but kind of good, in a jerky kind of way. We requested chopsticks (definitely not the eating utensil most in this place were using), which proved largely pointless: the meat was just too chewy. So, I ate with a knife and chopsticks, a new approach for me. 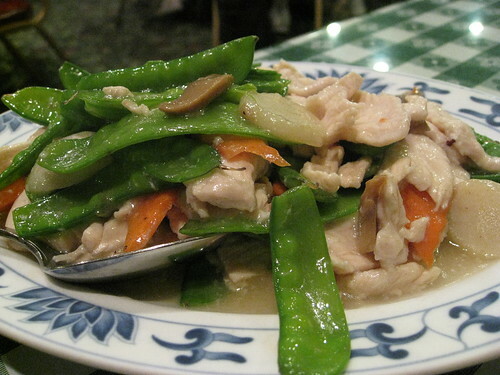 The Wife had an almost taste-free chicken with pea pods; I’ll say this, these were not Chungking canned pods. Like the broccoli, these pods were very fresh and nicely done, not overcooked, not bad. 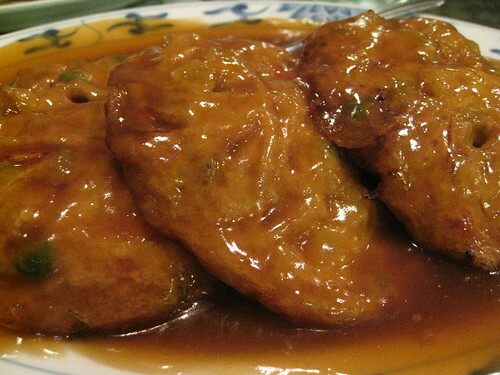 I sucked down two of these egg foo youngs. For six bucks, a helluva lot of tasty chow; it needed soy soy sauce, and I unabashedly drowned mine in the stuff. Most of the food verged on frighteningly sweet, gravies heavy with cornstarch, and the flavors almost neutral. Still, we both left really happy and pretty full and were hungry in the proverbial two hours, proving, if any proof were necessary, that food can be just okay and still perfectly satisfying. But how were the egg rolls? Not that I partook but the Crab Rangoon is supposed to be very good as well. It seems that some of the quick takeout places are giving you these small, mostly wrapper, shadow of egg roll things. (New Fue City on North or the recent string of See Thru Kitchen's on Roosevelt). With the health consciousness and the minimizing of salt I think Chinese food has suffered the most. Especially with the Egg Foo Young. Actually I have taken to substituting the Garlic Gravy which helps a bit in the flavor department. 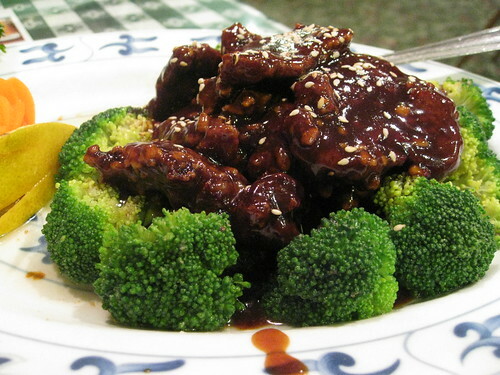 Orange Beef (or anything (chicken) for that matter), usually with a sticky sweet sauce ala Chinese buffet without much orange flavor. I'll sometimes order the sauce on the side which brings the sticky, sweetness down a notch. Real orange flavor and a thin slice or two on top. But I digress even further. Luo's? It has been there forever and make it a point to stop by every 10 years or so hoping it has improved from sub-par to, maybe, good but it still fills it's niche and keeps on rolling along. Maybe if they were a little bolder with the seasonings? But then again we are supposed to be watching our salt. Panther in the Den wrote: But how were the egg rolls? Didn't try the egg rolls, though I was tempted; The Wife was resisting the egg foo young, so I was happy to get away with that and so put it to other uses. Despite the name, the food here is more Cantonese than Pekinese, with freshness trumping spice. The orange beef was advertised on the menu as "HOT!" but packed not even a little heat. Such it is, with Oak Park Chinese. The egg rolls are quite good. Everything else is as described - disturbingly bland, sweet, and sticky. Fried rice is reasonable (I just wish they did better BBQ pork). At last an alternative in light of this discussion. Look for the big Johnson's as a mark of quality! I am sure most of the meals discussed here is Cantonese food. Canton (Guangzhou as it locally known) being a major seaport would take some traditional Chinese dishes and tone them down or sideways for the international visitors. It was quite a surprise when I opened my first regional Chinese cookbook and noticed most of my favorite 'Chinese' dishes missing. Perhaps when Cantonese food was brought to America it was dumbed down even further to appear less exotic. I'm concur with David. Pretty bland, but not horrible food. The so-so Thai place next door is probably a better bet.